With yet another New York Bridal Fashion Week in the books, we are looking back on all the fabulous trends that are still inspiring us! From suits, to new textures and fabrics, we are nothing but amazed at what the upcoming season will bring! There’s something for every bride when it comes to bridal style, and we loving where bridal fashion is headed. Keep scrolling to see our top three favorite trends from the Spring 2020 runway, and visit our Instagram profile for more live-action photos straight from the shows under the “RUNWAY” highlight tab! This dainty, spotted print made its way up and down the runway this season, and we can’t get enough. From studded and jeweled polkadot looks, to our favorite and more commonly seen Swiss dot fabric, these feminine gowns made quite a statement. Be sure to look for this fabulous Blush by Hayley Paige style from the Spring 2020 collection at Bella Rose Bridal, J.J. Kelly Bridal, and Prim. While pantsuits are nothing new to the New York runways, bridal short suits are! While we saw many short styles ranging from rompers to cropped top ensembles, we most often saw shorts paired with a blazer-cut jacket. This suit set from Reem Acra is one of the more sleek looks we saw this spring, with another major fashion week trend – minimalism – on display. Shop the all-new Reem Acra collection locally at J.J. Kelly Bridal. Striped gowns were back this season, and in a BIG WAY! We spotted every look from bold lines, like in this Wtoo gown, to more subtle textures layered beneath traditional floral designs. This playful patters is a great option for any preppy, nautical-inspired, or whimsical wedding! Shop this look and other Spring 2020 Wtoo bridal gowns locally at J.J. Kelly Bridal, The Bridal Boutique, and Prescott Bridal. Looking for other trends straight from the runway? 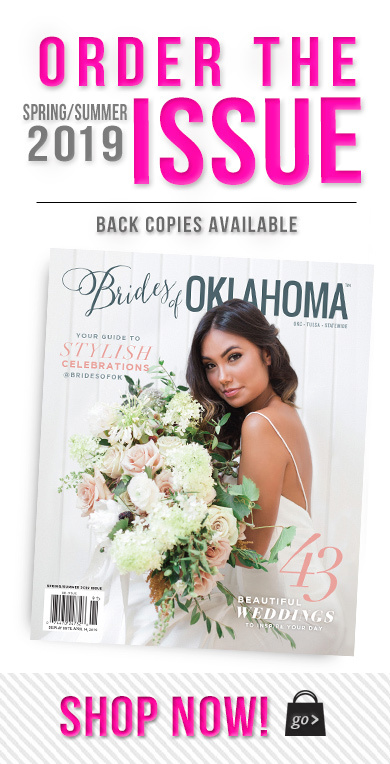 Keep a look out for the newest designs to hit our favorite local stores in the months to come at J.J. Kelly Bridal, The Bridal Boutique, Prescott Bridal, Prim, Bella Rose Bridal and Chantilly Couture. 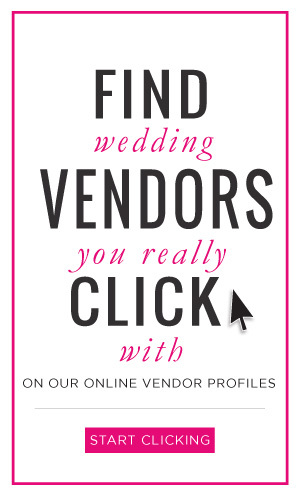 If you’re looking for a modern venue for your upcoming wedding, you’ve come to the right place! Today we are sharing seven of our favorite modern Oklahoma wedding venues that are filled with contemporary charm and one-of-a-kind style. Enjoy! The beautiful 21c Museum Hotel OKC venue in downtown Oklahoma City is perfect for any event, from your ceremony to your rehearsal dinner. Located in the historical Fred Jones building, this contemporary venue is artsy, unique and has a large event space to fit your needs! 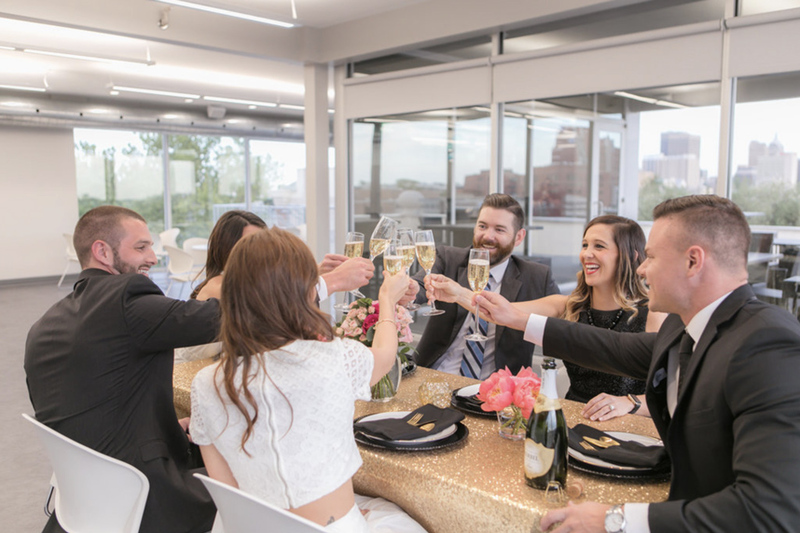 The sophisticated dining, unique spaces and exceptional art of the Oklahoma City Museum of Art makes it the perfect location to host any special event. 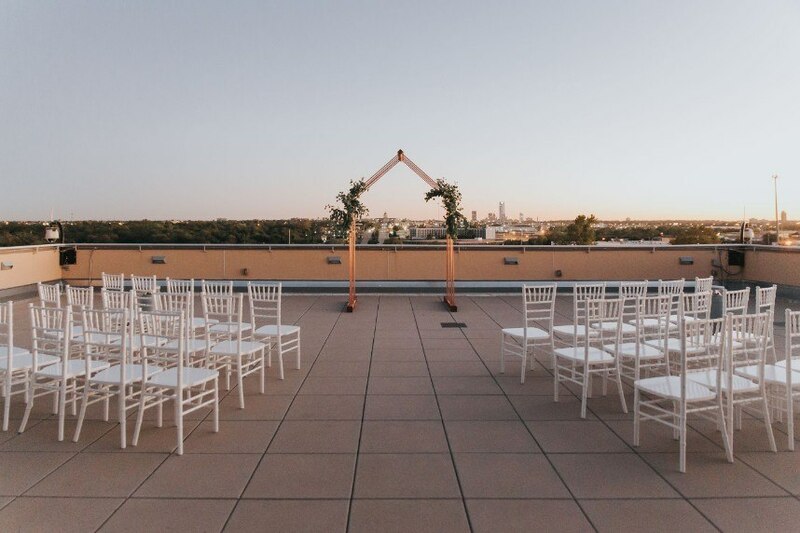 Located in the Arts District, you’ll find beautiful rooftop views of OKC and a one-of-a-kind experience. High above the clouds, V2 Events at Vast is something special! Enjoy several private event spaces on the 50th floor of the Devon Tower with V2 Events at Vast. 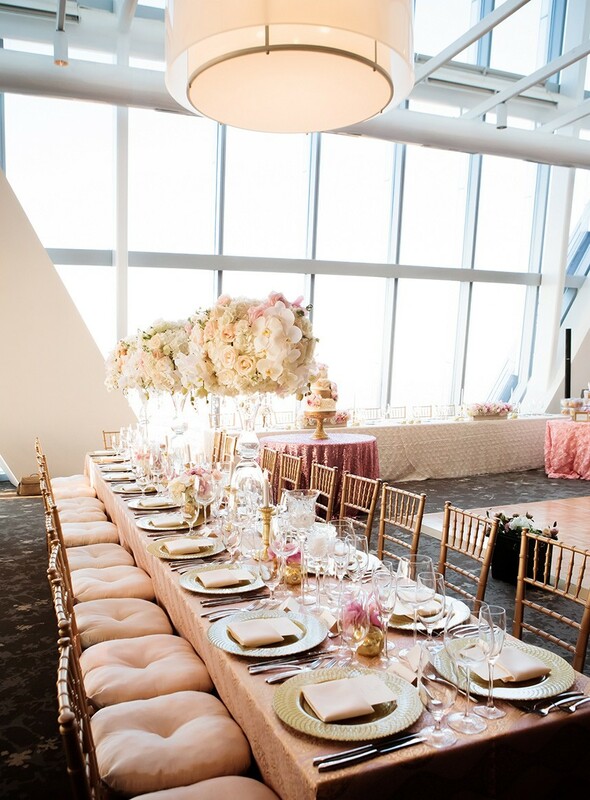 The contemporary, chic rooms feature an intimate setting for your event as well as beautiful downtown views. The service and food with V2 is unlike any other! 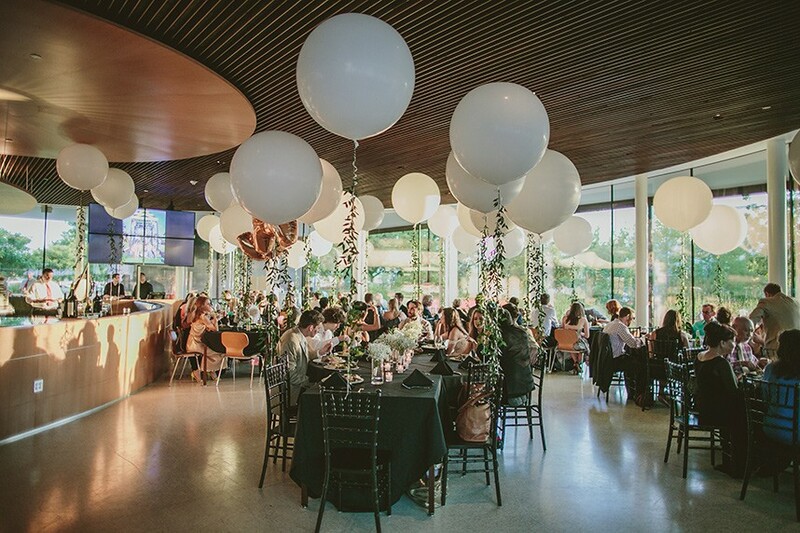 Make your event a truly unforgettable experience with views of landscaped gardens, breathtaking sunsets and the nighttime glow of the Crystal Bridge Tropical Conservatory at Park House at Myriad Gardens. This venue is ideal for a modern garden themed ceremony, reception and so much more! Sunsets over OKC can’t be beat with a view like this! 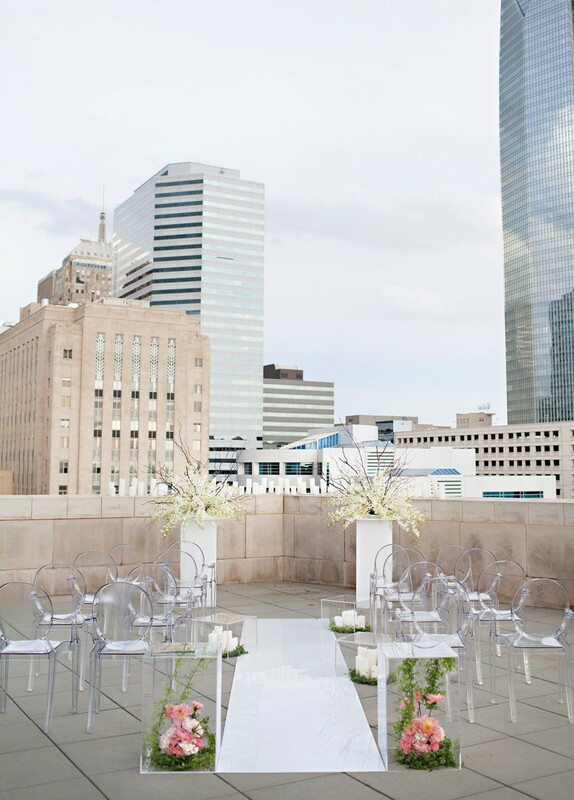 If you are looking for a more modern feel with an epic skyline view, Capitol View Event Center might be for you. 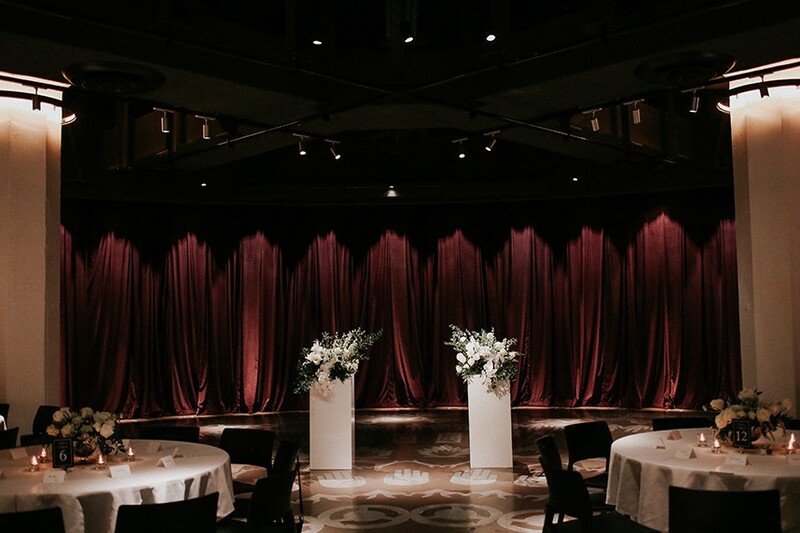 As a blank canvas, the venue sparks creativity and lends itself to any type of design. Whether you envision a simple setting or lavishly decorated reception, the space can easily transform to the beautiful event of your dreams. Oklahoma City’s NEWEST, Premier Event Space is Sanctuary Asia at Oklahoma City Zoo! 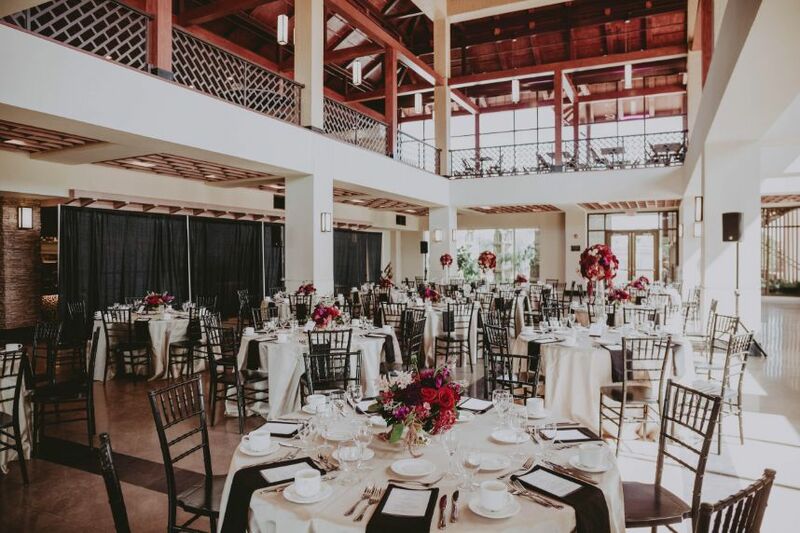 Be one of the first to host your wedding reception in the Zoo’s spectacular new event space, Sanctuary Asia, with stunning floor to ceiling windows overlooking the elephant, Asian rhino and komodo dragon habitats. What could be better? A scenic outdoor lawn and a southern style wraparound veranda beckon us for a floral engagement celebration at the beautiful Golf Club of Oklahoma! Just eight miles from Tulsa, this stunning venue appears straight out of a movie, sitting on 525 secluded acres of scenic land, with towering oaks and a 32-acre lake. It’s the epitome of a country club soirée and Andi Bravo Photography captured this berry and plum-hued scene beautifully! Joining deep floral notes with fruity tones, the feminine setting came together seamlessly! Blue Label Bartending provided the colorful cocktails, while Ever Something livened up every corner of the space with incredible blooms of all shades pink and purple. Subtle hints of gold popped up throughout the venue and even on the gorgeous four-tier cake from Laurannae Baking Co. It wouldn’t be a floral engagement celebration without a statement-making ring, and the oval halo cut beauty from Jewels by Simpson is a stunner! A bold watercolor invitation suite from The Letter Box sets the tone, inviting guests to this sweet southern celebration – we can’t get enough! Cheers! We are here to give you the 411 on all things 90s color and flair with this flashback styled shoot, styled by Alli Coleman Events! Inspired by Ralph Lauren’s country club vibes and model Cindy Crawford, this team set to work creating the ultimate preppy wedding inspiration at The Baumberhof. Vibrant yellow blooms by Poppy Lane Design and patterned linens from Marianne’s Rentals Special Event Solutions were juxtaposed with navy blue accents. The five-tiered navy blue cake by Amy Cakes with textured, cross-hatch piping makes for a perfect stand-alone centerpiece. There was no better way to announce this special soiree than a classic monogram invitation suite by No Regrets. With all the 90s fashions coming back in style, it’s no wonder we’re loving this model’s bride’s look! Her structured, strapless ball gown and lengthy veil from J.J. Kelly Bridal are to-die for! Profile Concierge Hair Service’s paired the glamorous look with sleek, middle-parted hair and a bright red lip (of course! ), and her ensemble was finished with a glam ring set from BC Clark Jewelers and a punchy yellow bouquet. Holly Gannett Photography captured all these 90s chic details, and you can bet we will totally be obsessing over them for decades to come. Major props! My oh my! This colorful and whimsical styled bridal shower by June Sixteenth Events | Florals makes our hearts melt! Kicking off this sweet soiree, Paper + More created a beautiful invitation with deckle edge paper and watercolor florals to invite guests to the intimate affair. The paperie was matched with place cards for the guests adorning the windows of Dresser Mansion and custom champagne bottle labels for an adorable toast to the soon-to-be-couple. A lounge was set outside with a vintage sofa, perfect for a photo op with the shoot’s photographer Tammy Odell, and a worn table ready to collect all the gifts, both from Runaway Belle Vintage Rentals. Inside the mansion, the party’s family style tablescape was set with effeminate centerpieces by June Sixteenth and a collection of minimalistic white and gold dinnerware from Party Pro Rents. Each place setting was topped with the guest’s own adorable mini cake created by Sweet Devotion Cakery atop plates from Plenty Mercantile, and a complementing nearly naked wedding cake was a centerpiece all on its own. Shades of pink were the perfect subtle tones for the dresses from Prescott Bridal that the real life bride, mother-of-the-bride and grandmother-of-the-bride chose to wear. Each look was completed with glimmering jewelry from Naifeh Fine Jewelry and elegant glam by BRUSHED Salon and Makeup Studio. We must call attention to the bride’s twisted updo, though – WOW! With a theme such as this, the bride-to-be is sure to be surrounded with love and well wishes from her friends and family. 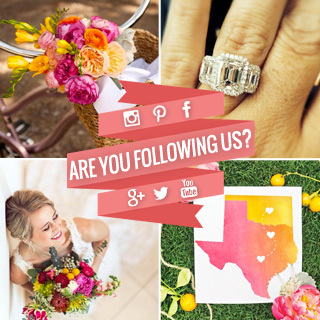 Keep scrolling to start planning the bridal shower of your dreams!